I'm David in Tifton, GA. For the last year and a half I've had some battery problems. I had trouble starting my car so I bought a new battery at a parts store in Tifton. At first everything was fine, then about six months later I had problems starting my car again, so I got a new battery. Again, everything was fine for another five or six months then I had trouble starting my car again. I went to get another battery and the parts guy said why do you need another battery, weren't you in a few months ago? So he tested my battery and it was OK. Apparently I've been replacing good batteries. What's wrong with my vehicle? Look, we can't fault David for not knowing what's wrong with his vehicle – he just didn't have enough information. And frankly, neither do I. Let's talk about where our friend went wrong and what he could have done. First, he was right to suspect his battery. 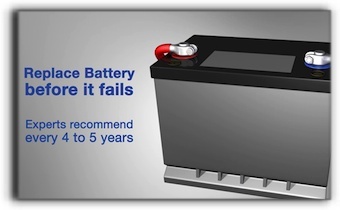 But if he had asked to have his vehicle battery tested when he first went to the auto parts store, he would have found out that his battery was still good and would have known he needed to take his car into Grimes Auto Service for further diagnosis. There could be any number of reasons his car wouldn't start. Unfortunately, he had a year and a half of unnecessary expense and inconvenience and still doesn't know what's wrong. When you find yourself in a situation like David, do yourself a favor and talk to a professional at Grimes Auto Service in Tifton. Your friendly and knowledgeable service advisor can get you on the right track.